Last year I experimented with “flipping the classroom,” and it didn’t work — but I learned a valuable lesson in the process, proving that experimentation in the classroom can often lead to unexpected but useful results. Here’s how it all started: over the years my powerpoint lectures have become increasingly sophisticated, with embedded videos and technological enhancements designed to keep my students engaged and entertained. But as my presentations got “better,” my students became increasingly passive, letting me do all the work. I knew it was time for a change. Despite the positive feedback, the cost of the required textbook remained prohibitive for many of my students, so I created my own online textbook, and began basing homework assignments on Smarthistory videos and other online resources. In addition to question prompts that guided them through the material, I also created Annotated Image assignments for key works that guided students through the process of image analysis. I was surprised to discover how much content they were able to absorb on their own, and the lively class discussions created a positive learning atmosphere that resulted in higher than usual retention rates. My students were engaged, and eager about learning. Why change things, then? Although my students were definitely learning better because they were more engaged, they still had difficulties with writing, and with developing a coherent academic essay. I found myself marveling at the fact that we devote class time to “content delivery,” when this is exactly the part of the learning process that comes most easily to students (as my experiment with homework assignments had proven). They are, in fact, quite capable of absorbing content on their own, but what they find most challenging is to synthesize their ideas into a coherent essay – yet this is what the traditional teaching model asks them to do at home and on their own. I found myself asking, isn’t this backwards? Shouldn’t the content-delivery be the homework, so that class time can be dedicated to helping students do what they find most difficult? So I took the plunge: with my online textbooks complete, I decided to abandon lectures altogether, and use class time for group work focusing on writing and critical thinking skills. Instead of doing homework, students were required to read online “chapters” before class, and during class they were divided into groups to work on question prompts. My thinking was that by practicing writing all semester, their ability to develop a coherent essay would improve. But it didn’t quite work as I had planned, and here’s why: in the first place, students weren’t coming to class prepared; without a graded worksheet to hand in, they had little incentive to complete the chapter reading. Secondly, the assigned chapters were just too long: The homework assignments had been successful because they focused on “chunks” of information that students could manage (as Michelle Millar Fisher writes, “They are sophisticated students, but want bitesize chucks of information“). But when students were assigned a whole chapter to read (complete with lots of embedded videos), it was simply too much information to absorb at once, and the group work environment was not conducive to the task of pulling it all together in a 50 minute format. Once I realized what was happening, I returned to my graded homework assignments (to ensure they were coming to class prepared), and my “flipped classroom” quickly evolved into a hybrid that alternated between group activities and mini-lectures (a format that sounds quite similar to Parme Giuntini’s recent post about her flipped classroom). Without quite planning it, I had discovered a format that was flexible enough to allow space for collaborative group work, while providing a more manageable structure to keep learning on track. Class lectures will be structured around homework assignments, and students will be called upon to answer specific questions, based on their homework assignments. For example, the lecture on Mesopotamia will begin with a discussion of the relationship between humans and gods, based on the Heilbrunn Timeline of Art History article on “Mesopotamian Deities” that was assigned. Students will also be called upon to practice the “skill of describing” by describing specific objects, based on what they learned from the assigned Smarthistory conversations. Group activities are scheduled when a foundation of learning has been established, and students are ready to work collaboratively to synthesize their learning and deepen their understanding. The “Annotated Image Assignment,” for example, asks students to “analyze” an image using arrows and labels, which they bring to an in-class workshop where they compare their analyses, and discuss how they would translate their annotations into a written essay. The workshop functions to solidify learning, while also preparing students for the challenge of developing Visual Analysis essay. One final observation: the homework assignments make it possible to “flip the classroom” at any time that seems appropriate, or to use a lecture/discussion format if it seems appropriate to the content. The important thing is that students are coming to class prepared, and this allows for a considerable amount of flexibility in how you want to engage them. 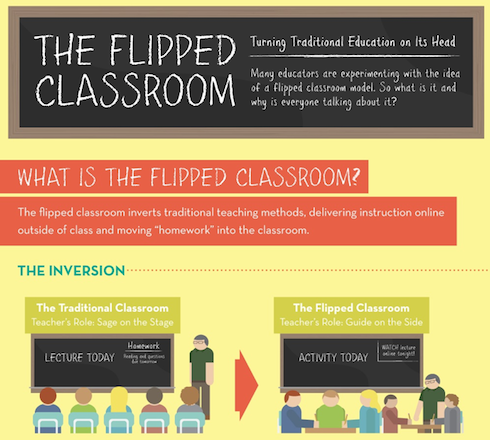 I really liked the process and format of your journey to the flipped classroom. I agree with you on how class time is best spent. I’m in a California college and we have new accreditation guidelines and core competencies that colleges have to demonstrate. One of the new activities that I have included each week is going through one of the reading responses (homework) with the class so that they can help critique and learn from each other. My students write everything digitally into an electronic portfolio which can be projected. I have already graded the homework (and students have my comments and the grade electronically) before they come to class. I have found it really helpful to start the discussion/activities with what is freshest in their minds—homework. Asking them to use the rubric and as a class go through one student’s homework has turned out to help them all in critical thinking and written communication. Working on the premise of constructive criticism (what is weak here? how could the argument be stronger? more convincing?) focuses their attention on how they would improve the existing answers. This takes about 15 minutes, always leads into the topic of the day’s activities and discussions and has been helpful. Works with both strong homework and weak; the whole idea is sharing how to improve. Thanks, Parme! That is exactly the approach I am taking in thecollaborative workshops, where students share their annotated image assignments. The goal is to have them evaluate each other’s assignment, and to learn from one another about how they might have done it better. I do use “model” student homework responses at the start of each class, as feedback on their graded homework assignments (and I have compared “acceptable” vs “above average” and outstanding” responses), but I never thought of asking them to use the rubric to evaluate for themselves! I might definitely give this a try! Melissa- this is frankly and simply AWESOME. I have been thinking for YEARS about how to flip survey one and you have done it. I LOVE the annotated image assignment and everything else. Thank you for inspiring me – and for being generous in sharing your ideas. So awesome.